It’s always cooler in Ukuleletown down by the docks. The wind comes in off the ocean, bringing with is smells and sounds from miles away. Maybe it’s that mysterious allure, maybe it’s the ‘island connection’, or maybe it’s some sorta wet synergy…but three different ukulele-driven songwriters have come up with three different songs about the same subject: mermaids. This is NOT a contest for best Mermaid song...just an illustration how different writers can approach the same subject SO differently! Oh, and the photo is of my kitchen door and my daughter Zoe. Oh, and be sure to check out this cigar box guitar project featured in MAKE Magazine (happy coincidence disclosure: Mark Frauenfelder, pater familias of Ukulelia is MAKE's Editor-in-Chief). And you thought Ukuleles were below the musical radar…get ready for the Cigar Box Ukulele Subculture. Everyone’s makin’ them; from luthiers like Joel Eckhaus of Earnest Instruments to Kevin Crossett of Kepasa Ukuleles. And they seem easy enough not to frighten off the budding luthier. Okay, so you’ve made one, before you get too cocky…take a look at what Sonny Daze has come up with: a double neck cigar box ukulele with a concert and a baritone neck. Yow. Man looking for Elvis finds Ukulele Trousers! Yes, I’m afraid it’s too true. Charlie Connelly, a ukulele player and elvis afficionado from across the Big Puddle, was watching a video of Cliff Edwards. In the beginning of the video, Cliff whips his ukulele out of his pants pocket and proceeds to play “I Feel Pessimistic” to a crowd of locker room lugs. Those are some cargo pants. Where can I find that line of clothing??? If this is Geek to you, I presume you know what to do. If this is all Greek to you, follow your guide, and fear not. What this means is that you can now subscribe to Ukulelia, and receive the latest news via a news aggregator (here's a list: pick your poison) that will allow you to follow all the latest posts on your favorite sites from one window. I'm on a Mac, and have had great success with NetNewsWire Lite (the free, but still very serviceable version of NetNewsWire). And if you're on a recently-released web browser like Firefox, chances are that it has an integrated feed function. Here's a wiki on Atom, the publishing protocol that Mark used to set us up that will give you more. And feel free to share your tips and trick in the comments section of this post. Aloha! Sometimes it is hard to see what is happening, especially if it is dark. One trend that’s emerging from the shadows of Ukuleletown lately is painted ukuleles. It is art, it is music. Take it on stage and wave it under the spotlights. One recent purveyor of this phenomenon is Mrs. Nipper in England. Dig the Roy Lichtenstein ukulele. Newsflash! Formby plays a figure eight! 'course, it is a tenor. 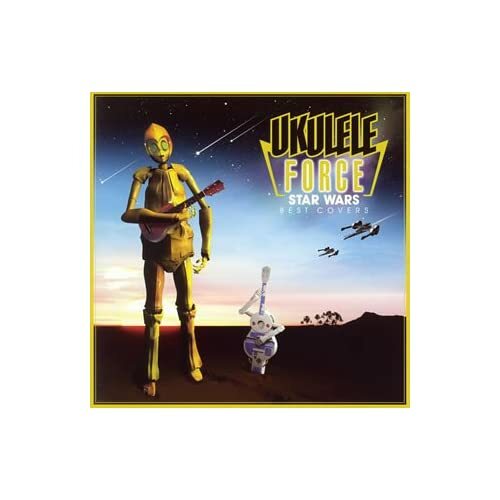 Sometimes nothing in Ukuleletown makes much sense. Shadows swirl around you and the night closes in from all sides. If things are dark, you look for light. What brings light to a musician’s life is the music. Not just playing it, but performing it for others. It is a particular rush that leaves you breathless and lit up...if it goes well. I have nothing but the greatest admiration for musicians who get up on stage and attempt to brighten up the lives of their audiences with some of that light. The 5th of January at Blooms Café in Lille, France. Francois, Narjisse and Morane, The Koenig’ Sisters, take the stage. The ukulele sings in Francois’ hands, Narjisse and Morane offer songs from the sixties. It’s always nervy, it’s always worth it. Get up and do it. "From NAMM...a picture of one of my ukes painted by underground comic book artist Mary Fleener. That's me, a diminished chord, and the Fleenalele in my booth at the show. I understand you're a ukaholic, so here's to you!" If you’re hangin’ out in the five boroughs of New York, or even close, this week, you need to put on your pointy shoes and best hat and head to the downtown. Lots of ukulele shows in the offing. Wednesday Jan. 24 at the Bowery Poetry Club…Tom Harker, Ron Hester,Sonic Uke, David Hornbuckle and the Dixieland Space Orchestra and Heather Lev. Thursday Jan 25 at Biscuit in Brooklyn…Uke Night with the Ukuladies, David Hornbuckle, Rush Kress, Kabu and Yoon. I’ve always liked the Pacific Northwest because it rains a lot and people drink a lot of coffee…okay, I’m oversimplifying. I’m stereotyping. (can a person ‘monotype’ something?) Nevermind, forget I said anything…. A unique music camp for ukulele players…beginners to advanced. Three days of instruction, and 4 nights of jamming and entertainment. In other words - Ukulele heaven! This Thursday afternoon Robert Wheeler showed up at my Ukuleletown domicile with only three cases. Of course, one case held seven ukuleles. I’ll let Robert tell you what they were…. Left most slot - Early(slotted wooden pegs) koa Supertone "Now this is ukulele!" 2nd slot - Early (slotted wooden pegs) "rope binding - mahogany - arguably the same maker as above - note fretboard asymmetrical bottom (which you can't see from side) on both ukes. Upright - hours old DaSilva 100 year (+) old redwood top from sunken logs/koa back and sides. I really like the Supertones. And to think you could get them at Sears as early as 1914! ...sorry to be so glib. BUT there is a great article on the Apple site by ukulele diva Nancy Eaton about Lyle Ritz and how he recorded "No Frills" using GarageBand. Really, just GarageBand. and don't forget the wonderful interview on the UkeCast! The Worcester Telegram and Gazette has a nice article on Melvern Taylor. You know...of Melvern Taylor and the Fabulous Meltones....? "On Monday the New York Ukulele Ensemble went into a recording studio in Chinatown. We -- 9 ukulele and a bass -- laid down 10 tracks in 3 hours. Such is the power of practice. On Tuesday, the producer and I mixed and mastered the CD. Yesterday the master was FedExed to the manufacturer. Meanwhile, I've uploaded one original tune "Ukulele Beach Bum” to our MySpace site for streaming/listening purposes. I'll add more streaming tunes as our CD release date gets closer. Enjoy!" This just in from Murray’s Spaceshoe in Gotham and the mad, mad mind of Jason Tagg. (Yep, that’s the guy who’s brought us Midnight Ukulele Disco, Ukulele Cabaret, New Year’s Uke Drop and Sonic Uke). It’s UKULELE FREAKOUT, being broadcast LIVE from Murray’s Spaceshoe in Gotham over the internet. Check out the first broadcast with Jason and Ted of Sonic Uke and Alan Drogin. So ya wanna be a Ukulele Superstar like that Jake guy, eh? Ya gotta ukulele and you can even tune it a bit…but where do you go from there? Tim Mann, one of the Noiristas and New England Ukulele Maven, is giving lessons for all you would-be plinkers out there. Yeah, yeah; I know your dog has fleas. Now go put a collar on it. oh, yeah; I lied about "big bucks"
Sadly, apparently available only in Japan. If you haven't noticed, ukulele players are the nicest folks around. And Ralph Shaw is even nicer. "...a few years ago I decided that I wanted a Kamaka painted pineapple uke, but I didn't have the bucks for one. I asked Robert Armstrong if he would paint an old plain pineapple for me with the famous design and he agreed so I sent it to him. After getting it, though, he realized that it would take too long to paint the standard Kamaka design, so he asked if he could try something different. I'm always up for something new, so I said sure, do whatever you want. Anyway, this is what I got, which I just love. I'm particularly pleased with the soundhole ring." Check out Ukulelia pal Bryan Tolentino's music video of his original mele Ka 'Ukulele Melele. And if you want to learn the tune, Dominator has transcribed it here. I've been on a Cheap Suit Serenaders jag of late. On the the Chasin' Rainbows CD is a fun tune called Mysterious Mose. In doing my usual poking around on the Web to learn more about it, I ran across this great Betty Boop cartoon, which apparently is what the tune was originally written for. This is only the second Betty Boop cartoon, and you'll note that she has not yet morphed into a human (woof!). Aside from a fun rendition of the song, the cartoon is remarkable for a couple of pre-Code things. One, Betty keeps getting scared out of her nightie. And second, well, let's just say it involves the melodic hindquarters of a moose. Awhile back, Craig and I sparred over who was the more enchanting jazz age singer: he said Ruth Etting; I said Annette Hanshaw. As it turns out, we both agree that there was one gal who trumps 'em both. Hang on to your mouse, because you're about to meet the incomparable Lee Morse. "She was 5 feet tall. She was less than 100 lbs "soaking wet". She spent her childhood in Oregon and Idaho yet was proud of her family's Southern roots. She could hunt and fish and, if you deserved it, she could punch your lights out! She was Lee Morse, one of the most popular female recording artists during the Jazz Age 20's and 30's. And, she is worth remembering. Start your journey with a listen to "Moanin' Low." It'll give you a sense of her effortless bluesy style and her incredible range. She was able to sing so low that many of her early recordings were labeled Miss Lee Morse, so listeners would know she was a woman. She often accompanied herself on the ukulele: we might assume this is her playing on "Tonight You Belong to Me." I love her hybrid of eefin' and yodeling on "Ukulele Lady." Next, read this article; it'll give you a quick sense as to Lee's colorful and tragic life. "Morse's vaudeville and stage career continued to grow during her Columbia years, and in 1930 she landed a huge role in Florenz Ziegfeld's "Simple Simon," a Rodgers and Hart musical. The role would have catapulted her to Broadway stardom, but the day before the show's debut she fell ill from a bender and was unable to perform. Another Columbia recording artist, Ruth Etting, stepped in for Morse and the show's hit song, "Ten Cents a Dance," became her signature tune. This stumble essentially ended Miss Lee Morse's Broadway career. Alcoholism haunted her for the rest of her life." The fact that you may be hearing her name for the first time tells you something about the end of her story. She was on the brink of a comeback when she died in 1954. ""Ukulele Ike, for instance, is a favorite. I guess you might call him a tortured soul, or alcoholic or God knows what else, but he could put a song across..."
Here's a recent profile of The First Family of the Ukulele States of America. Otherwise know as the Beloff/Webb Clan. Shown at left is Dale and Phyllis Webb and a sneak peek inside Magic Fluke HQ in New Hartford, CT. It's a cloudless night in Ukuleletown, cold as a lonely razor. I’m hurrying down an alleyway after coming out of the back door of Lenny’s Downtown Bar and Grill. Okay, maybe I’m a little wobbly. Maybe I’ve had more than one “wobbly”, but I’m still walkin’, and the cold air is sobering. Anyway, whatever the hell they were, they get me thinkin’ about flying objects, and, since this is Ukuleletown, about flyin’ ukuleles. Roy Smeck used to toss his ukulele in the air at the end of a song. Giving it a twirl. Showmanship? I dunno. Jason Tagg, on a recent episode of Midnight Ukulele Disco, did a flashy toss’n’twirl at the end of a song he sang with Ellia and Josh Bisker. And he didn’t drop it. The 1959 Horror Film, The Giant Gila Monster. Don Sullivan sings and plays banjo ukulele. Ah, yes; another sleepy afternoon in Ukuleletown. Robert Wheeler showed up at my door with beer in one hand and a gaggle of ukuleles in the other. How could I resist? Who could? A Ukebrand soprano...beautiful old style sound and look. very light. A DaSilva Concert heart...this one surprised me with it's sound and playability. This is the very baritone that Eddie Connors created and designed and was strung re-entrant. It had a particularly interesting and useful tone for a bari. And the case it came in was so….so…right. Yeah, yeah; I know it's pretty shameless...but isn't this why we do all...this? It was a warm night for early January. Ukuleletown is usually blanketed in snow this time of year, but not Friday. Ukulele Noir 21 was happening and there was a nice crowd of smiling drinkers in the audience. Couldn’t be there? It was a great night…here are a few videos of the performers. Turn down the lights, pour yourself a cocktail, kick back and watch. Dig the Founder's great Ukulele Consciousness rap. Ukuleletown is full of con artists and snake oil salesmen, but, every once in a while a smiling helpful face emerges from the shadows and spreads a little good karma around. Yeah, karma, wanna make something of it? and Ukulele Cabaret. Jason is always coming up with new and interesting ukulele players and introducing them to the public. He also plays a mean ukulele in Sonic Uke with his duo-ist Ted. Sun Tzu said “know thy enemy…” (or somethin’ to that effect). I suggest it is better to know thy friends. This just in: Curt Sheller has a new book out “Exploring Jazz Chords on Ukulele” It’s good. There’s ALWAYS something new you can learn. “I've also started a new series of online lessons titled Chord of the Week. Each week I take an open position chord and show the movable form and variations for that chords. Done in "C" tuning with practice progression and transposition chart and with a "G" tuning transposition chart. There are 21 one chords. The first two are up. so practice yer uke and you can have a cupcake, cupcake. There are always a lot of great ukuleles showing up at a Ukulele Noir. The pool table in the back of the Sky Bar is turned into a ‘staging area’ for the performers’ instruments. Nobody brings just one ukulele. Robert Wheeler, who often does a “surprise guest” spot and illuminates the audience in the mysteries of Ukulele Consciousness while playing a few tunes…usually brings a different ukulele for each song he does. 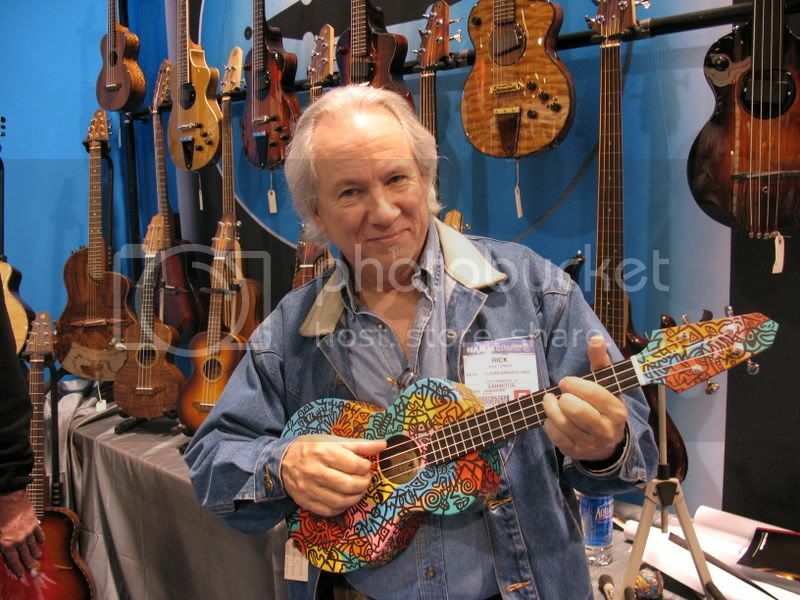 This week he brought two new ukuleles just made for him by California luthier Mike DaSilva, and they were honeys. Noiristas are no strangers to Mike’s ukuleles, Mark Occhionero plays an SM-1 that sounds killer. But one of the sopranos Robert brought was special and outstanding: the top and face of the headstock were one hundred (or more) year old redwood that was recovered from the water. There is a MOP koa tree logo on the headsock and the back and sides are dark koa. The sucker sounded and played great. I was loath to put it down, man. Way loath. I’ve always been a big fan of the Harmony Vita Ukulele, particularly in the hands of a real player. Driftin’ in on a breeze from Gotham, a guy named Gideon showed up on Midnight Ukulele Disco doin’ a tune called “Broken Kneebone Barry” with aforementioned ukulele.